Despite Jacksonville’s familiarity with playing in England — it was the Jags’ sixth consecutive year of playing overseas, and they had won their last three — the record crowd of 85,870 formed a decidedly pro-Eagles crowd. That didn’t matter early as the Jaguars took the first lead, forcing a fumble with a sack of Wentz on the opening possession. Josh Lambo made a 51-yard field goal. Wentz was intercepted in the end zone by Jacksonville’s Jalen Ramsey on the ensuing possession, ending an eight-play, 63-yard drive on which the Eagles appeared poised to score. They were unable to answer until midway through the second quarter, when Jake Elliott made a 31-yard field goal. 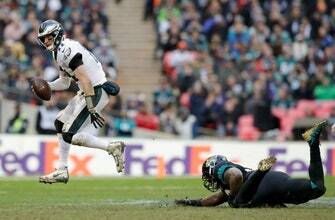 But Lambo inched the Jaguars ahead again by making a career-long 57-yard attempt with 2:48 remaining until halftime. After forcing the Eagles to go three-and-out on the following possession, the Jaguars appeared poised to run out the clock. But a hit by rookie Avonte Maddox on wide receiver Keelan Cole after a 16-yard reception into Philadelphia territory gave the Eagles the ball back. Wentz and Goedert made the Jaguars pay, needing only a minute to score when Goedert’s 32-yard catch helped Philadelphia claim a 10-6 halftime lead. The Jaguars followed with a sustained drive of their own, marching 75 yards over nine plays and finding the end zone when Bortles connected with Dede Westbrook under the uprights to trim their deficit to 17-12. Jacksonville failed to score on the ensuing 2-point conversion when Bortles couldn’t find Westbrook a second time. The Eagles scored the decisive points with 10 minutes, moving to 24-15 on Ertz’s 5-yard touchdown reception and the extra point. Jacksonville once again failed to score a touchdown from the red zone, with D.J. Chark dropping a 6-yard pass in the end zone on third down before another Lambo field goal. Philadelphia: RT Lane Johnson injured his left knee on the Eagles’ opening drive and did not return. LT Jason Peters was evaluated for a concussion late in the second quarter but returned after halftime. OLB Kamu Grugier-Hill left in the first half after an unspecified injury but was able to return, and CB Jalen Mills (foot) was injured a minute into the third quarter and missed the rest of the game.